Last night we all went to the welcoming party for the new tram. There were probably a couple thousand people at the event. The main show started at 5:30 followed by some drinks at Nick Wilsons and the Mangy Moose. It was an entertaining evening. 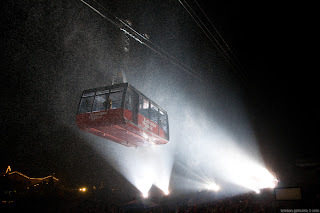 Loud music, spot lights, snow, fireworks, Santa Claus, PBR, and of course, the new tram.